Velda Olson, 77, of Columbus, formerly of Leigh, died Sunday, October 8, 2017, at the Genoa Care Center. Funeral Service Wednesday, October 11, 2017 10:30 A.M.
Velda Marie Olson was born September 8, 1940, near Leigh, Nebraska to Oscar and Hulda (Lueschen) Michaelsen. She attended area schools and graduated from Leigh High School. On April 19, 1959, she married Victor O. Olson at Christ Lutheran Church, rural Columbus. They lived and raised their family in the Leigh area and moved to Columbus in 2005. Velda was a housewife and very involved in the Leigh community. She was a member of Zion Lutheran Church where she had served as Church Secretary, organist, choir member and was a member of the Sewing Circle. Velda was also involved in the Keynoters , a local singing group, and she and Judy Blessen were instrumental in starting the pre-school and day care at Zion which still operates to this day. 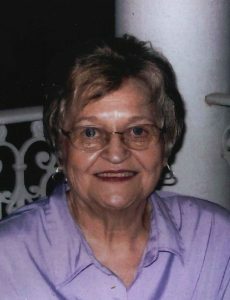 Velda is survived by her husband, Victor Olson of Columbus, one daughter, Pam Stoffel of Dahlonega, Georgia, three sons; Jeff (Kay) Olson, Madison, Patrick Olson of Lincoln, Mike Olson of Leigh, two sisters; Alta (Harvey) Nauenberg of Columbus, Selma (Larry) Loseke of Platte Center, brother Roy (Sylvia) Michaelsen, Clarkson, six grandchildren; Melinda (Ben) Maxwell, Kristine ( Matt) Gohring, Andrew (Carolyn) Olson, Jenny (Zach) Wendt, Rylee and Jared Olson and six great-grandchildren; Nolan and Grady Maxwell, Trent and Kinlee Olson and Harper and Carter Wendt. Also surviving are two brothers-in-law, Roland Wilke and Herb Korcek, many nieces and nephews and a host of friends. Preceding Velda in death were her parents, daughter-in-law Caree Olson and two sisters, Mildred Wilke and Dorothy Korcek.